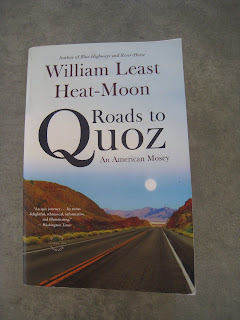 The Little House of Concrete Bookshelves: William Least Heat-Moon "Roads to Quoz"
If you put your finger on a map of the United States, I have been within at least 25 miles of that place. 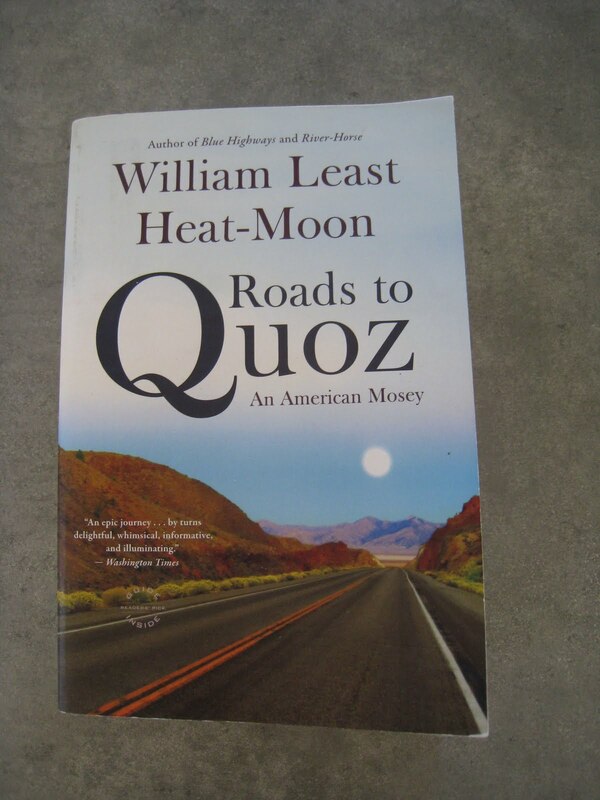 William Least Heat-Moon (if you want to be pernickety and stick with things like birth certificates, William Lewis Trogdon, born 27 August 1939) made that statement, and, according to p. 504 of Roads to Quoz he's got the details logged in a 1966 U.S. road atlas to prove it. You may look at that statement, and the topographical corroboration and ask why anyone would bother. In that case you'd probably be advised to read no further, because Least Heat-Moon isn't likely to be your cup of tea. On the other hand, having read and thoroughly enjoyed Blue Highways: A journey into America, PrairyErth (A Deep Map) and River Horse: A Voyage Across America I was lining up for a copy of Least Heat-Moon's latest wanderings as soon as I noted its existence, though I must admit it took me a while to get through it. Least Heat-Moon isn't the sort of writer that'll have you churning through the pages to find out what happens in the end, the way I've done recently with Stephen Booth and Stuart MacBride crime novels. It's more a case of keeping the book beside the reading chair and delving into the next part when the mood takes you. And if the mood doesn't take you for a day, or a week, that's fine. It took me two months to finish a book that I started soon after it landed in the P.O. box in late June. Least Heat-Moon, whose genealogical background traces back through English, Irish and Amerindian (specifically Osage) roots, is the second son of a man who called himself Heat Moon. Since the big brother was Little Heat Moon, the youngest son would be Least Heat Moon, assuming, of course, there are no further siblings down the line. Second, the other titles in what's not an over-large bibliography given a writing career that stretches back over three decades. 1982's Blue Highways, effectively the travel journal associated with a three-month road trip in 1978 identified him as a writer worth following. Losing your job and separating from your wife is likely to leave a bloke at a loose end, and while some might be inclined to mope and hit the bottle, Heat-Moon hit the road, specifically the secondary roads coloured in blue on U.S. road maps, avoiding cities and travelling the back blocks as he circumnavigated the United States in a van called Ghost Dancing. Elvis Costello's My Dark Life contains references to obscure locations like Ugly Texas, Nameless Tennessee and Peculiar Missouri, and while the index to Blue Highways is completely bereft of mentions of Ugly and Peculiar the asterisk beside Nameless indicated a place of encounter or extended comment, as do similar marks beside such intriguing locations as Dime Box, Texas and Tuba City Arizona. That sort of travelogue isn't the sort of thing that can be repeated ad nauseum, though there will be some who'd be inclined to try, and Heat-Moon followed it with an ecological and historical account of Chase County, Kansas in PrairyErth (A Deep Map): An Epic History of the Tallgrass Prairie Country. He's writing about a place where towns have populations under a thousand, and there's not much more than the odd creek running through prairie grassland, though it's rather close to the geographic centre of the continental United States. You'd expect an author would be pushing the proverbial uphill with a forked stick to get anything much out of such a subject, but this rather hefty tome weighs in at over six hundred pages. Not something you're likely to devour in a single rushed read, but worth exploring for those who find that sort of thing intriguing. Then, another nine years later, with a side excursion into history with 2002's Columbus in the Americas, Roads to Quoz:An American Mosey sort of takes up where Blue Highways left off. This time, rather than starting here and proceeding on a single journey till he arrives there he's detailing a number of shorter journeys over a number of years in the company of his lawyer/historian wife Jo Ann, referred to throughout as Q. The assumed destination, Quoz, in case you're wondering, is an 18th-century word that can be defined as anything strange, incongruous, or peculiar. I'd add obscure to that little definition. Readers with an interest in world exploration may have heard of the Lewis and Clark expedition, commissioned by Thomas Jefferson to find a direct & practicable water communication to the north-west Pacific coast of the United States, study the plants and animal life along the way and discover how the region could be exploited. Heat-Moon covers some of the same territory in River Horse close to two centuries later. Lewis and Clark were examining the upper portion of the territory added to the United States through the Louisiana Purchase, and even if the reader is aware of them, you've probably never heard of the Dunbar-Hunter Expedition of 1804 which travelled through the lower part of the Purchase, following the course of the Ouachita River from its source in Arkansas to its confluence with the Mississippi and provides one of the starting points for Down an Ancient Valley, the first of half a dozen journeys chronicled in Roads to Quoz that covered around twenty-five thousand kilometres of wanderings over three years. Along the way he takes the reader to the Great Mound, the second-highest pre-Columbian earthworks in America, erected by a remarkable civilization a thousand years before Civil War soldiers built a gun emplacement on the top and Louisiana Governor Huey Long's highway department reduced the rest of it to almost street level in 1931, removing a significant archeological feature for use as road fill. From there, it's off to meet a friend from university who wants to investigate the vanishing waterman’s taverns along Florida’s Gulf Coast. That's a trip for the boys, with the wives off on a side trip as the husbands travel through the state's panhandle, searching for the lost Florida that's maybe a step ahead of extinction through development, and finding the Road to Nowhere which turns out to be a landing strip for the local drug running fraternity. As you may have gathered the narrative ranges widely across the landscape, tracking down the Quapaw Ghost Light in Missouri, delving into the case of freethinker William Grayson, shot down on the street in Joplin, Missouri, in 1901, and tasting Oklahoma spring water that locals use to kill ticks on dogs. As you'd expect, the pages abound with characters, a long term correspondent whose carbon footprint was that of a house cat, a man who set out to raise the funds to establish a school for disadvantaged children by massaging lonely widows with special massages, the guy who looks after the thirty-something metre original scroll manuscript of Jack Kerouac's On the Road and men who've set out to photograph every mile of the Ouachita and US highway Route 40, allegedly more significant than the better known Route 66). That last task is rendered marginally more difficult by the fact that Route 40 no longer exists as an identifiable entity and various sections need to be, more or less, rediscovered. Whether there's much else out there to be discovered would be at consideration when it comes to writing a sequel. You'd suspect, for example, there's not much point in a similar exercise once you've ridden a bicycle along abandoned railroad tracks. While there are probably plenty of other abandoned railroad tracks out there you'd encounter issues if you wanted to cycle down a lot of them. Still, on the basis of Blue Highways and Roads to Quoz, if there are enough chance encounters and idiosyncratic individuals in the United States to form the basis of a third, similar volume, William Least Heat-Moon would be the man to track them down. He did, after all, parlay a county with an area a tad over two thousand square kilometres and a population (at last count) of less than three thousand into a six hundred page book. As the man himself puts it, If you leave a journey exactly who you were before you departed, the trip has been much wasted, even if it's just to the Quickee-Mart. That's probably as good a description as you're going to get of the modus operandi of a man who's less interested in where he's going than how he gets there and who he meets along the way. Heat-Moon's probably an acquired taste, but for those who have an interest in his literary territory (an odd mixture of literature, wordplay, homespun philosophy, history, geography, travelogue and memoir) it's a taste worth acquiring.